Last week Innerspace organized a group of 13 people to dive some of the most beautiful dive sites in the world! God’s Pocket is a small dive resort on Hurst Island just off the coast of Port Hardy. The resort runs a small staff that works hard to make their guests feel at home. Bill was our captain and made sure we saw the best sites at the right time according to the tides (3-4 dives a day). While we were diving Annie was making home cooked meals and preparing our cabins. Oliver was our lovely dive master helped us on the boat and made sure we had enough air to see all the beauty beneath the sea. We had an awesome crew of divers from across North America that went out to face the currents, sheer rock faces and extreme water temperatures to explore the ocean. Chad Edwards, Innerspace Owner, came prepared with back up gear, fixed suits and equipment and made sure everybody was prepared for the conditions. He also managed to capture some of the beauty of this area with his incredible underwater photography skills. Check out some of the shots below and in our Photo Gallery! If you missed out this time be sure to contact the store and ask about our Barkley Sound cold water dive trip in September. Timbersled SnowCheck offers you a chance to preorder your 2018 Timbersled System to guarantee delivery in Fall 2017. Enjoy exclusive options that are not available at any other time of the year including custom colours and limited edition models. SnowCheck includes special financing of 3.99% for 48 months, a free fixed install kit or the equivalent value off a TSS upgrade. 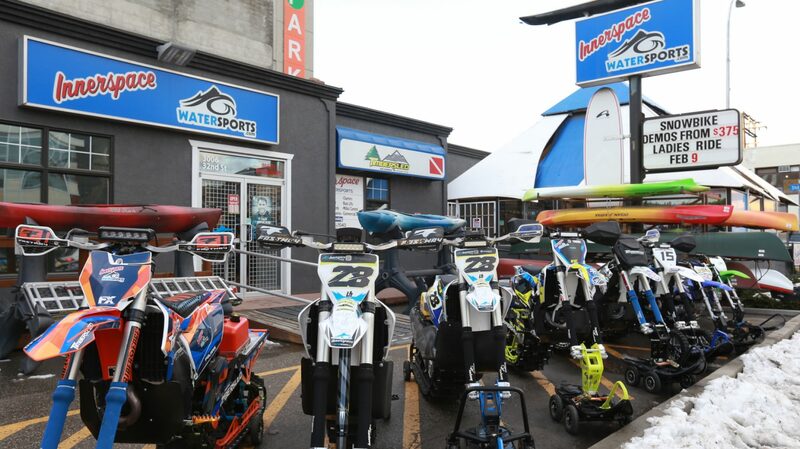 To finalize an order, you must complete and submit a non-refundable, non-transferable minimum deposit of $500.00 at Innerspace Watersports prior to April 15th, 2017. All orders will ship in Fall of 2017. Pre-Spring Kayak Sale – As winter’s end is near, it is time to prepare for the upcoming paddle season! Come and see the latest brands and models. Save tax on any 2017 boats. Pre-register for scuba lessons before winter’s end and get a $200.00 gift card toward the purchase of equipment. Don’t miss out on this great savings opportunity! Moorestown, NJ – SeaLife recently announced their latest addition to the Micro camera series, the Micro 2.0 underwater camera at the DEMA (Diving Equipment Manufacturers Association) trade show. The successor to the Micro HD, the compact Micro 2.0 is also fully sealed and flood-proof down to 200 ft/60 m. With no O-rings or doors to maintain the Micro 2.0 camera comes fully equipped with powerful 3+ hour internal rechargeable battery and 32 GB or 64 GB of internal memory. The Micro 2.0 features a 16MP SONY® CMOS image sensor providing stunningly vibrant stills as well as sharp full HD videos with 1080p HD @ 60 frames per second or 1296 HD @ 30fps. The 130° wide angle fisheye lens allows you to get close and fit everything into the scene. Color correction filters are not necessary. Choose between four Land and Sea™ scene modes with three built-in underwater color corrections for diving or snorkeling, and by depth or lighting being used. You’ll never miss the shot with the fast shutter response time and one-touch video recording. The camera’s lens focuses as close as one foot (12 inches/30 cm), that distance can be cut in half with an optional Macro close-up lens. Ergonomic and compact at around 4 inches wide with a large 2.4” color LCD screen, the Micro 2.0 has three “Piano Key” controls that control all the cameras essential functions, the large keys make it easy to operate with or without dive gloves. SeaLife Underwater Cameras are made by Pioneer Research in Moorestown, NJ and were first introduced in 1993. In 2000, SeaLife developed the world’s first digital underwater camera. In 2007, SeaLife developed the first non-housed digital underwater camera, and in 2013 SeaLife introduced the powerful Sea Dragon Lighting system and its innovative Flex-Connect tray, grip, arm and accessory system. In 2014, SeaLife introduced the Micro HD, the world’s first permanently sealed underwater camera. SeaLife Cameras and Lighting Systems are sold and serviced in 64 countries around the world. Rain or shine – it’s still summer !!! Enjoy fun for the whole family by taking the opportunity to try out stand-up-paddle boarding or kayaking at our rental facility at Kalamalka Lake Public Beach in Vernon, BC. British Columbia is widely recognized as the #1 dive destination in North America. The host of this exciting dive trip is Hornby Island Diving is a family business that has been owner operated for over 40 years. Their knowledge and experience means visitors get safe, fun dives at the best sites. The guest lodge, dive boat and tank fill station are among the best in BC, so everyone can enjoy their wonderful diving in comfort. Non-divers and families love Hornby Island and they are always welcome to join. The waters around Hornby Island are full of marine life. In any season, you can encounter octopus, wolf eels, seals, large ling cod and rock fish, colourful anemones and nudibranchs. In winter, Steller’s and California sea lions gather in the area to feed on huge schools of herring. Good visibility and gentle currents make the Hornby Island area easy to dive. Drift dives, wall dives, deep dives, and sculpted sandstone reefs are all part of the underwater terrain. Barkley Sound is roughly a big bite taken out of the West Coast of Vancouver island. In a triangle it is enclosed by Bamfield in the south, Ucluelet to the north and Port Alberni in the middle. Coming from Port Alberni and going south, you descend the Alberni inlet to where it meets the Barkley Sound. Inside, a maze of islands unfolds and offers a stunning landscape. The Broken Islands group in the west are part of the Pacific Rim National Park. Barkley Sound offers a unique richness in both plants and animals. Underwater you will find a rich diversity of fish, invertebrates, marine mammals and kelp forests. Salmon, rock-fish, herring, squid, giant octopus, sea otters, seals, and sea lions are all permanent residents. Others like orca, grey- and humpback whales, Puget Sound King crab, sea pens, and six gill sharks add flavor to your dives and make your stay unforgettable. In the majestic forests you may find everything from beavers and otters, to bears, cougars, eagles and many more species. They form integrated eco-systems with the life in the water. Sea life abounds in the cold, clear ocean that surrounds Nanaimo. Jacques Cousteau considered these waters as “the best temperate diving in the world, second only to the Red Sea”. Join us on June 3-4-5, 2016 on five (5) spectacular wreck dives off the west coast of British Columbia. In 1997, the Canadian navy vessel HMCS Saskatchewan, a 366-foot destroyer was sunk off the shores of Nanaimo to create an artificial diving reef. The Saskatchewan was joined on the ocean floor by the HMCS Cape Breton, a retired Canadian supply ship, now recognized as the World’s Largest Artificial Upright Reef. In February of 2005, the Nanaimo Dive Association sank a third vessel, the RivTow Lion, a retired deep sea rescue tug. The RivTow rests at a manageable depth of about 50 feet in Departure Bay, making it a great dive for beginners seeking some experience before plunging down deeper to the cape Breton or Saskatchewan. Call us today to book your place for this fascinating dive trip. More than 136,000 PADI Professionals (Professional Association of Diving Instructors) have issued more than 23 million scuba diving certifications around the world. The PADI System of diver education is based on progressive training that introduces skills, safety-related information and local environmental knowledge to student divers in stages. Courses are student-centered and provide maximum practice and realistic application. PADI Professionals make underwater exploration and scuba diving adventures possible while maintaining the highest standards for diver training, safety and customer service. Call now for more information.